The blade is at the heart of the portable band sawmill. Yet, to many, blade maintenance is almost as much art as it is science. There are nearly as many tricks and techniques for sharpening bandsaw blades as there are recipes for the perfect barbecue sauce. To make matters even more complex, there are many factors, which make a blade perfectly suited to one type of wood perform quite poorly in another. If you have your own sawmill blade sharpening equipment, you have the ability to experiment and “tweak” the blade to suit your needs. Otherwise, you should look for a blade sharpening service that will work with you. When referring to blades, pitch is the distance between the teeth. A 7/8” pitch blade, for example, has teeth spaced 7/8 inches apart. This is the most common type of blade and used for general lumber cutting. For cutting hard wood, especially logs which have been down for years and dried out, a close pitch of ¾” will generally work better. With the closer pitch, each tooth takes a lighter cut, helps keep the blade vibration to a minimum and therefore ensures cleaner cuts. There is a practical limit to how closely the teeth can be spaced, since there has to be enough room between the teeth to contain the wood chips as they are being cut. This area is called the “gullet”. If the gullet is full of sawdust while the blade is still cutting, wood chips spill over the side of the blade while it is in the cut and can force it to climb or dive. This is a main cause of waviness when cutting wide slabs—each tooth has a lot of wood to remove on its trip through the log and the gullet can fill with sawdust along the way. If you notice more sawdust than usual on your wide slabs after a cut, maybe you should consider slowing down the blade feed rate a bit. The bottom of the gullet is the weakest part of the blade and the primary place to watch for cracks. Retire any cracked blades as soon as you can. They have a limited remaining life and will invariably break at the most inconvenient time. Blades come in a variety of thickness. While you might think thicker steel blades would be stiffer, stronger, cut straighter and last longer, you’d only be partly right. Thicker blades are under more stress from the constant bending and straightening as they go around the bandwheels and are therefore more likely to crack. Stiffer blades also take more power to bend around the bandwheels and the wider kerf of the thicker blades requires more power and takes a slightly wider kerf, resulting in more sawdust and less board. The best blades generally compromise between strength and stiffness. Norwood’s Goldline Premium band blades, for example, are specifically manufactured for the 19” bandwheels and a range of engine power options on their mills. If you look closely at the teeth of a bandsaw blade, you will find the tips are bent in a repeating pattern of one up, one down, one straight. The amount of bend is the “set” of the blade. Even though it is only a slight amount—around .022”, it is enough to keep the blade sliding smoothly through the wood without pinching, even if there is stress in the wood, which there usually is. After the blade has been sharpened several times, the teeth need to be re-set. If one side of a blade has more set than the other (like after you skimmed a nail embedded in the wood), the blade will often try to cut toward the side with more set. When that happens, the best course of action is to put on a fresh blade and put the offending blade aside for re-setting. The rule of thumb used by the old-time sawyers is “tighten it until it smokes, then back it off a half-turn.” This is a good reason to not let certain people run a bandsaw mill! Band mills use finesse instead of brute force to cut through logs…and blade tension is a good example. While adding blade tension may help a dull blade cut straighter, it also puts more stress on the blade and on the mill. Once you get a feel for the mill, you will usually use the same blade tension for all cuts. The best way to use the T-handle tensioner is to tighten the blade until you feel it just start to pull, then always tighten it the same number of turns past that. If you have a sharp blade and it dips or rises in the cut, you might try increasing the tension a half-turn at a time, but it is far more likely a fresh blade will solve the problem. 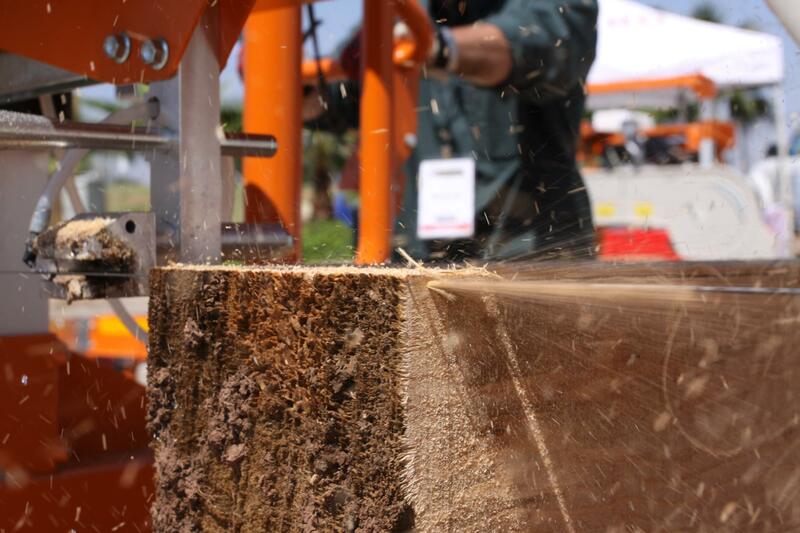 One of the most overlooked causes of wavy cuts is the speed of the blade through the wood. 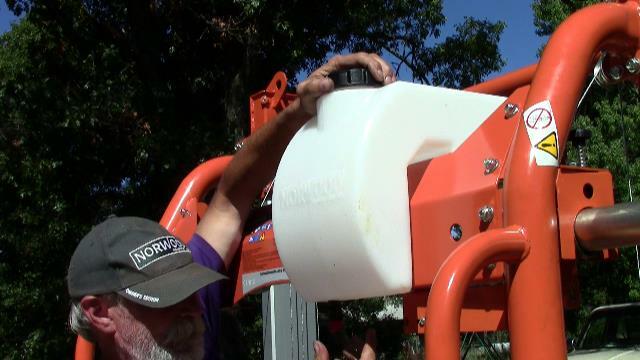 Portable sawmill blades are designed to travel through wood at a specific rate. A slower than optimum blade speed often causes wavy cuts. Some of the common causes of slow blade speed are running the mill at less than full throttle, have a loose drive belt, a throttle cable which has slipped, or you are pushing too hard enough and lugging down the engine. 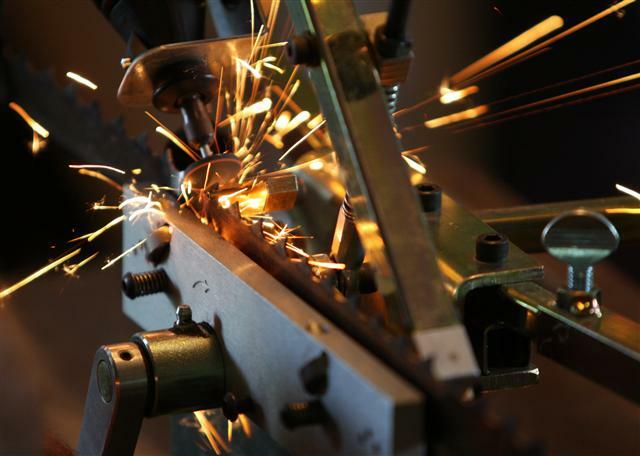 Most portable bandsaw mills are geared to provide the best performance at full engine RPM, but it is worthwhile to check it if it doesn’t seem to be running as well as it should. Experienced sawyers use a tachometer to make sure the engine is running at the optimum RPM. Depending on the make and model of the bandsaw mill, it will use either ceramic guides or guide rollers. The adjustment of ceramic guides is pretty straightforward. The blade needs to be at its normal operating tension. Simply adjust the back guide to about 1/8” behind the blade and the top and bottom guides until they barely clear the blade. The technique I use is to fold a piece of a plastic shopping bag over the blade, then adjust the top and bottom guides so they just touch the plastic. Spin the blade to remove the plastic and it is right on. Another point about ceramic blade guides is they can be knocked out of adjustment if the mill throws a blade. Be sure to check them after such an event. If you feel extra drag when you turn the blade by hand, check the guides first. Roller guides, on the other hand, press down slightly on the blade—about 1/8”—to keep the blade straight. The collar on a guide roller should be about 1/8” from the blade when the blade is at normal operating tension. The rollers should turn freely when you spin the blade. Some people put a mark on the bearings to make it easier to tell whether they are turning. Whichever type of guide you use, keep a spare set, along with tools to adjust and replace them. Ceramic guides can break and roller bearings can seize up over time. There is always a good debate about the best fluid for lubricating sawmill blades. I have milled without lubricant for years, and continue to do so, unless I have a problem with pitch buildup on the blade. The most common lubricant is straight water, though some special recipes include Pine-sol or Simple Green to break up the pitch or even a mixture of diesel fuel or chain saw oil at a slow drip (though the latter is not recommended because it disintegrates your belts). Another solution to stay away from is dishwashing detergent; it can make the blade so slippery it may come off the bandwheels! Another tip from experienced sawyers is to apply light oil, such as WD40 or diesel to both sides of the blade at the end of the day and when removing a blade for sharpening. Good mill operation involves taking the tension off the blade when you shut down for the day. Some sawyers even do this when they break for lunch. There are several reasons for this depending on who you ask. Leaving the blade tight on the bandwheels compresses the belts or rubber rim at that point, which could cause vibration when you start up cutting again. Others claim leaving the blade at full tension puts a permanent bend in it. What I am certain of is “it can’t hurt” to release the tension when the mill is not running. It goes without saying (but will still be said here), always wear leather gloves when handling blades! They are sharp and can do some damage. Have any questions or suggestions for optimal blade use or maintenance? Your comments are always welcomed.